The Longitudinal Controller Stanley block computes the acceleration and deceleration commands, in meters per second, that control the velocity of the vehicle. 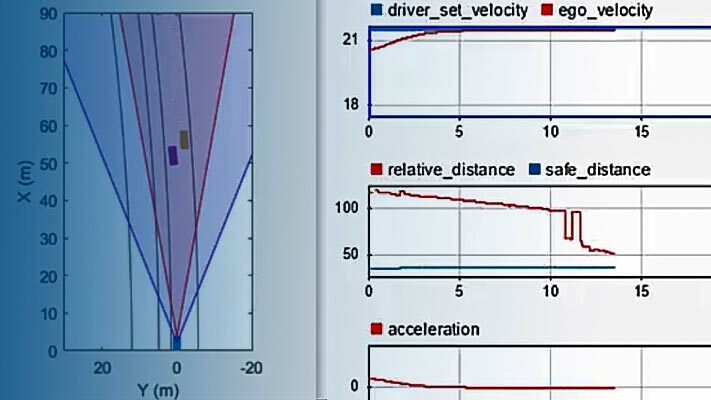 Specify the reference velocity, current velocity, and current driving direction. The controller computes these commands using the Stanley method , which the block implements as a discrete proportional-integral (PI) controller with integral anti-windup. For more details, see Algorithms. You can also compute the steering angle command of a vehicle using the Stanley method. See the Lateral Controller Stanley block. Reference velocity, in meters per second, specified as a real scalar. Current velocity of the vehicle, in meters per second, specified as a real scalar. Driving direction of vehicle, specified as 1 for forward motion and -1 for reverse motion. Trigger to reset the integral of velocity error, e(k), to zero. A value of 0 holds e(k) steady. A nonzero value resets e(k). Acceleration command, returned as a real scalar in the range [0, MA], where MA is the value of the Maximum longitudinal acceleration (m/s^2) parameter. Deceleration command, returned as a real scalar in the range [0, MD], where MD is the value of the Maximum longitudinal deceleration (m/s^2) parameter. Proportional gain of controller, Kp, specified as a positive real scalar. Integral gain of controller, Ki, specified as a positive real scalar. Sample time of controller, in seconds, specified as a positive real scalar. Maximum longitudinal acceleration, in meters per second squared, specified as a positive real scalar. The block saturates the output from the AccelCmd to the range [0, MA], where MA is the value of this parameter. Values above MA are set to MA. Maximum longitudinal deceleration, in meters per second squared, specified as a positive real scalar. The block saturates the output from the DecelCmd port to the range [0, MD], where MD is the value of this parameter. Values above MD are set to MD. Control the velocity of a vehicle in forward motion using a longitudinal controller. Construct an automated parking valet system in Simulink® with Automated Driving Toolbox™. u(k) is the control signal at the kth time step. Kp is the proportional gain, as set by the Proportional gain, Kp parameter. Ki is the integral gain, as set by the Integral gain, Ki parameter. Ts is the sample time of the block in seconds, as set by the Sample time (s) parameter. e(k) is the velocity error (CurrVelocity – RefVelocity) at the kth time step. For each k, this error is equal to the difference between the current velocity and reference velocity inputs (CurrVelocity – RefVelocity). MA is value of the Maximum longitudinal acceleration (m/s^2) parameter. MD is the value of the Maximum longitudinal deceleration (m/s^2) parameter. At each time step, only one of the AccelCmd and DecelCmd port values is positive, and the other port value is 0. In other words, the vehicle can either accelerate or decelerate in one time step, but it cannot do both at one time. The direction of motion, as specified in the Direction input port, determines which command is positive at the given time step. Hoffmann, Gabriel M., Claire J. Tomlin, Michael Montemerlo, and Sebastian Thrun. "Autonomous Automobile Trajectory Tracking for Off-Road Driving: Controller Design, Experimental Validation and Racing." American Control Conference. August 2007, pp. 2296–2301. doi:10.1109/ACC.2007.4282788.